Insiders say that the change is motivated by marketing, and not politics like some might assume. The Captain America film will get a little tweaking in the name department before it hits Russian movie theaters. The movie's full title is "Captain America: The First Avenger," but in Russia, the words "captain" and "America" have been given the boot, and the movie will just be known as "The First Avenger." People involved with the name change - which also applies to the Ukraine and South Korea - have made it clear that it is motivated by marketing and brand awareness, and not politics. According to insiders, there was some concern that the Captain America name didn't have as much recognition internationally as other Marvel characters. The company was pleasantly surprised to discover however, that that wasn't the case in most places in the world, and that it only needed to change the name in three international markets. The change has garnered some support, perhaps most notably from X-Men: First Class director Matthew Vaughn. He thought that dropping Captain America from the title was a good idea but wondered if it might need to be more widespread. "It's going to be interesting to see how the movie does internationally with that character's name," he said. While politics may not have motivated the movie's name change, it's clearly something that director Joe Johnston has taken into consideration. According to Johnston, the script makes it very clear that Captain America is not a "jingoistic American flag-waver," but rather just a good guy who is given extraordinary abilities. 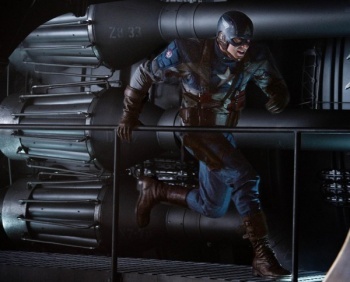 Captain America: The First Avenger opens in theaters in July.